An outbeak of the exotic pest, the giant African snail, threatens village and commercial agriculture in the Solomon Islands. The snail carries an organism, infection by which can cause severely illness in people. The snail has been detected in the village of Feraladoa in the hills behind the Solomon Islands capital, Honiara. Growing up to 15cm long and 5 to 8cm in width, the brown with yellow-cream stripes, night-feeding pest eats vegetables and fruit. An internal worm causes brain disease in people if they eat uncooked snails or snail slime left on unwashed vegetables. TerraCircle plant pathologist, Grahame Jackson, said the snail is easily spread attached to plants, timber and household items and as eggs in soil and sawdust. 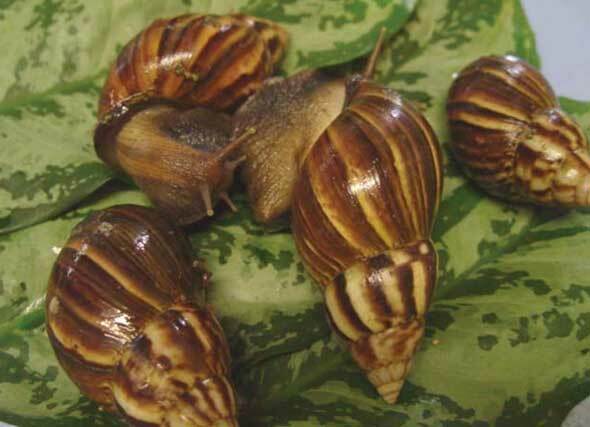 The Solomon Islands Agriculture Quarantine Service is asking people to report any discovery of the snail. TerraCircle has produced an information brochure, supported by the Solomon Islands Ministry of Agricutlure and Livestock, Improved Plant Protection in the Solomon Islands and the Australian Centre for International Agricultural Research, alerting people to the threat presented by the snail.